Another series of the adventures of Sherlock Holmes as reported by his faithful biographer Dr. Watson and it becomes clearer than ever that the real draw of these stories is the fascinating character of Holmes himself. The mysteries are secondary to the enjoyment, though many of them do prove to have distinct elements of interest (otherwise why would the great detective have bothered himself about them? 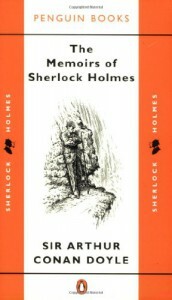 ), but it really is in observing the fascinating character of Holmes himself that the reader is immersed in them. Indeed, this collection provides a rare treat for the reader in that we learn more about the detective and his early life and connections than has previously been the case. Thus it was that some of the most interesting stories here, for me at least, were those that hearkened back to Holmes’ youth and showed us the man he was and in which we can see the seeds of the man he would come to be. Of course one can’t leave off discussion of this volume without making mention of “The Final Problem” the story in which Holmes’ greatest adversary Moriarty, the Napoleon of Crime, is born. Doyle had grown weary of the public clamour for more tales of his peerless sleuth and decided it was time to end it so that he could concentrate on other characters and stories. Well, as it turns out this was not to be, but what resulted was an exciting tale in which Holmes finds himself pitted against the greatest adversary of his voluminous career. After months of playing cat-and-mouse with Moriarty and his insidious league of crime Holmes finally has gathered the pieces he needs to crush the vast criminal organization and its most dangerous leader. Moriarty, of course, is not likely to take such a possibility lying down and thus we have a final chase across London and Switzerland that ends in an off-screen (and thus retcon-able) death for both Holmes and his adversary. Watson’s final realization of what has happened to his friend is moving, as is the typically dry (though sincere) letter which Holmes leaves for him on the edge of Reichenbach Falls. All in all, while some of the tales may have been weaker than others, I can’t do anything other than give this collection a five-star rating due to the great interest of the many tales of Holmes’ early life, as well as the singular event of his “death”.